Guaranteed parking is available for all events held at Nationwide Arena. Click here to reserve. 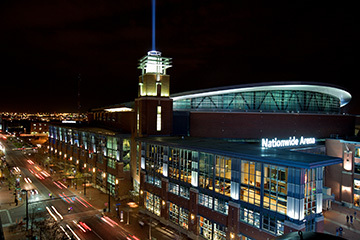 Nationwide Arena is a multi-purpose arena located in the Arena District of Columbus. The facility opened in 2000, and serves as home of the NHL's Columbus Blue Jackets. When the venue is not hosting hockey games, it is used for concerts and events including the annual Arnold Classic, a sports and fitness event hosted by bodybuilder and former Governor of California Arnold Schwarzenegger. The venue is conveniently located at the heart of the Arena District, and is surrounded by house bars, clubs, and a movie theater. It is also nearby Huntington Park, home of the AAA baseball team Columbus Clippers, and is a sister facility of the Lifestyle Communities Pavilion and Arena Grand Theatre.